One of the new games revealed at the PC Gamer show at E3 2018 is a new title being published by TinyBuild and developed in a tandem effort by Explosm Games and Galvanic Games called Rapture Rejects. 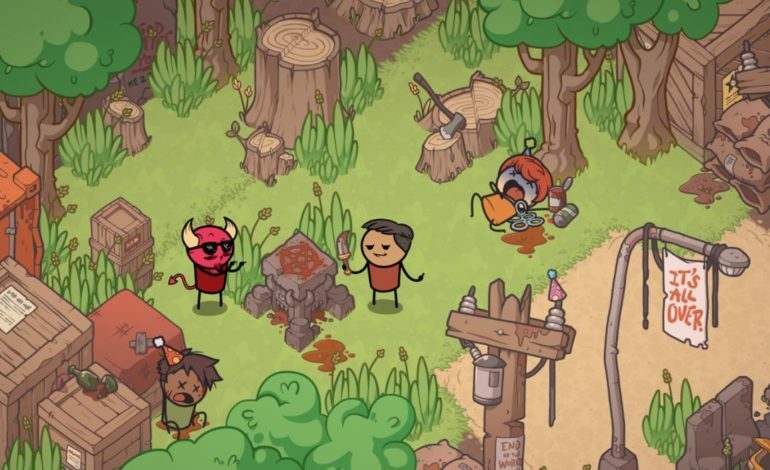 Set in a post-apocalyptic version of the Cyanide and Happiness universe, the game looks to be a 2D isometric battle royale game about killing your fellow sinners to get on God’s good list. The trailer shows two men, one a classic God-loving Christian and one a booze-loving rocker roommate, on the night of the Rapture, a Christian event heralding the end times. Naturally, the virtuous guy gets left below while his roommate is one of the ones who get beamed up to Heaven. Seconds after, those left below start tearing apart what remains of society, and our religious friend gladly joins in the fighting. As you do. The game is described as an isometric top down last man standing game, which likely means it will be a battle royale. However, the isometric view might make it stand out a bit from its first/third-person rivals. Designed in the art style of Cyanide and Happiness, the sinners will explore a variety of locations as they fight to be the last one alive and earn God’s approval so He’ll let them into Heaven. The game looks like it will have all the humor of the creator’s webcomic, as the trailer finishes off with a short skit of an old man kicking off his overbearing wife who doesn’t want him to ascend before raking the leaves. As it turns out, God doesn’t really approve of such behavior. Rapture Rejects is slated to release on Steam “2018-ish”. You can sign up for the alpha on their website here.